We wanted to give you all the technical & essential skills you need to make that happen. We finally reveal the absolute best API to automate your computer. How those files are best handled and how to use them to your advantage. Learn why manipulating files on your computer using Python is so powerful. How badasses use the Regular Expression language, and how you can too. Become a data mining GOD, who can mine for absolutely anything. Go from not knowing where to start with freelancing, to collecting your first juicy paycheck. Aaron Bernath will be your instructor for this state-of-the-art Python automation program. 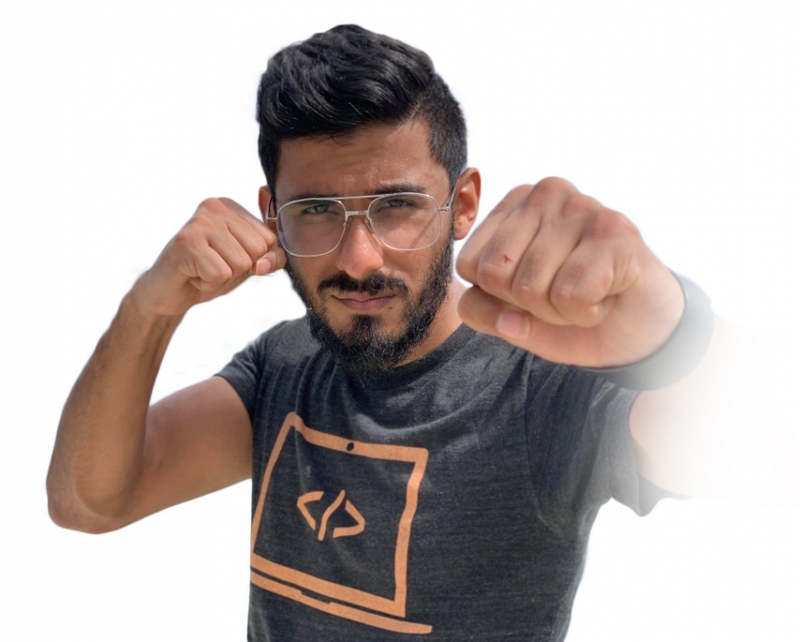 He's a Georgia Tech Graduate Student (Badass) who's won multiple coding competitions & ranked 1st in the state. Now he's here to drop knowledge bombs on your 🍑. Yep. Learn skills to save you time by making Python do the heavy lifting for you and basically 10x the speed at which you gain results in your career as a Python developer. Amass a suite of projects you can upload to your own personal portfolio to show off to recruiters and employers and increase your chances of landing jobs and clients. Learn the “street smarts” of coding (Python scripting to speed up everyday tasks) vs the “book smarts” of coding (complex, long, powerful code), because a developer that know’s how to code complex algorithms, but doesn’t know how to use code to solve practical real world every day problems, is only half complete. Leverage one of the easiest to learn programming languages of all time to increase your work efficiency and output. Get one huge step closer to being a highly demanded web administrator, one of the highest in demand jobs in 2019 and beyond. You'll be on the fast track towards becoming a badass file analyzing data scientist. Feel way more prepared to be a scarily effective system administrator, who's a boss at organizing systems. Gain the ability to problem solve independently and attack any new problem that faces you through projects, generalization skills, and examples. Learn the skills you need to NEVER have to do a mundane office or personal task again manually or by hand. You'll have software developer recruiters hitting you up on the daily. Learn the essential skills needed to be an automating machine, with Python. Generate your first $1,000 and more by boosting your automation skills with this beginner friendly course. Save hundreds of hours of time by learning how to make Python work for you while you sleep. Be able to replicate others who have made and saved multiple thousands of dollars for their companies. Learn in 6 weeks what you usually would in 6 months if you taught yourself or took another course on the subject. Be able to make your computer use itself, like a wizard. If you don’t love this course and you’re on the 29th day, 23rd hour, 59th minute, and 59th second… I’ll give you your money back. I’m also going to munch on those delicious processing fees for you. Why do I offer this juicy guarantee and why am I so confident? I’ve scoured the internet down to the deepest layer of hell finding invaluable blog posts, resources, curating countless bookmarks, watching every YouTube tutorial, using Udemy/Edx/Coursera, and everything else to learn what I have learned. I’ve personally taken every Python & Django course on the planet. No joke. I’ve bought all the books, courses, and even invested thousands of dollars hiring professional Django developers to coach me. After, I took all of that and turned it into one simple system that’s NOT EASY... But WILL get you results when you follow it. I then taught 100’s of students this material 1-on-1 by coaching them. They loved my material and they got results. PERIOD. I’ve invested thousands of hours of my own sweat and labor, curating, crafting, researching, and building the perfect course for you that gives you the same experience as when you drive a Rolls Royce. This material is well researched, tested, and proven. I want to make it really easy for you - take the course and try for yourself. If you don’t love the course or don’t see ANY results, email me, show me you did the work, and I’m going to refund you 100% of your money back. As simple as that. Capiche? Try out Automate With Python Like a Badass for a complete 30 days and 100% risk-free. "I was working as a freelancer since 2014 before I joined the course. I am a senior CG generalist and after taking your course I took a task that was taking a team in Brazil 7 days to complete and I automated it with Python in 4 hours. So basically, I made $1,200 in 4 hours." "I saved my company at least $23,000 with python after taking Qazi's course by customizing my company's laboratory information management system." No course shows you how to boost effectivity with coding. No course shows you how to automate parts of your life, and position yourself to work on more creative problems (which make the big money!). Will I have lifetime access to this course? You’ll struggle but if you work hard, the payoff will be so worth it. … And you don’t need any math before joining this. What happens once I buy this course? You’ll get an email from me in which I will give you access to the course. You’ll have LIFETIME access to it. I’m a developer, is this course for me? You’ll learn how to leverage Python to it's fullest automation capabilities. You’ll learn how to earn a side income from getting coaching clients. You’ll learn how to use specific strategies to position yourself as a trusted advisor (consultant) and not just a-freakin' commodity who has to compete on the lowest pricing. You’re unemployed (unless you have lots of money saved up where you can comfortably join the course. You’re NOT gonna get far if you’re under pressure). You’re in debt (join the course later once you’re out of it). You understand that this requires hard work and patience to get the right skills. You understand that you’re going to get any results overnight. You’re someone that believes in taking action. You watch the material and then you actually APPLY it. You have an open mind. You’re open to thinking about money in a different way. You’re open to earning an income from coding without needing a bajillion years of experience. Hiring a mentor who charges you $70 an hour. Getting 3 hours of training from them per week would cost you about $840 a month. Once you use this course to start earning an income... I actually suggest you DO hire a mentor, nothing will improve you faster. Remember. The difference between poor people and rich people is very subtle. Poor people look at what’s the cost. Rich people look at what’s it worth to them. What would this course be worth to you if it got you even one client? 99% of my material is free… But I charge a premium price for the very best stuff. Lastly, this course is so good you can’t afford to NOT have it. 5-10 hours a week will make you good and that’s the least effort required to go through this course. 10-20 hours a week will make you great. 20-30 hours a week will make you a legend. If you have any questions or concerns about the course, email us. We're happy to help. 30 Day Money Back. Just show me that you put in the work & I'll give you back your money no questions asked.